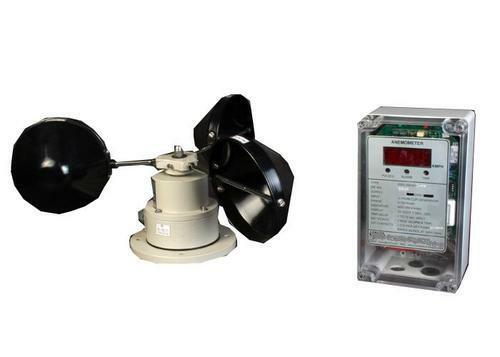 Protocontrol make wind speed Anemometer is consist of a sturdy wind sensor (Cup Generator) and wind velocity indicator. The wind speed is sensed by a three-cup rotor assembly. Sensor is fitted with the cup such that when cup shaft rotates with speed, pulses are generated. The electronic unit is housed in field mounting IP 65 housing. It provides digital display of speed as well as provides relay contact when speed exceeds set limit. Models with retransmission O/P (4-20 mA) with respect to wind speed are available.